Of course GURU was a proficiently manufactured biopic, but it could as well have been made by Milan Luthria. AAYUTHA EZHUTHU had its sparks of brilliance, yet one struggles to even remember the names of its lead characters. And RAAVANAN, well, we Mani Ratnam fans bought that DVD just so we could burn it on Dussehra. And because of these films, KANNATHIL MUTHAMITTAL will always be that special one with which we saw the last of Mani Sir, the master who wielded the power to etch characters in your mind for a lifetime, the craftsman who mesmerized you with visuals so simply executed, yet poetic enough to make you gape with awe, the genius who ensured even the most stone-hearted left the theatre with that lone tear struggling to squeeze out of the corner of their eye. 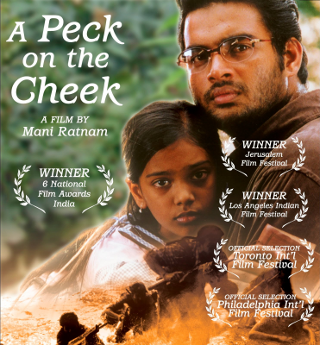 KANNATHIL MUTHAMITTAL, or A PECK ON THE CHEEK as it was known in the international film festival circuit, stands tall in Mani Ratnam’s body of work not just for its superlative craft, but more so for its emotional connect. A film Iranian in its approach, yet replete with spectacle synonymous of Indian cinema, Ratnam explored an issue as significant as the Sri Lankan civil war through the eyes of Amudha, a nine-year-old girl. Beautiful characterization, heart-wrenching performances, superlative usage of music and song to express emotion, and gorgeous cinematography are just some of the aspects that make this film so memorable. Fans of pre-Roja Mani Ratnam often argue KANNATHIL MUTHAMITTAL is overtly melodramatic, slow, sappy and too simplistic a view of a very serious issue. Ratnam would perhaps plead guilty, but quite unapologetically at that. Ultimately the perspective of the film is that of a child who could not possibly comprehend the complexities of war, but become aware of and be terrified by it. As it is with most Ratnam films, the big canvas of the war is simply an excuse to draw importance to a very simple story at the crux. On her ninth birthday, Amudha’s parents disclose to her that she was adopted. Her parents, Thiruchelvan and Indra are progressive thinkers who believe she has a right to know the truth. Despite repeated warnings from Ganesan, Indra’s father, who argues that a nine-year-old will find it difficult to process something like this, the couple reveal the truth anyway. Amudha instantly regresses into a state of confusion, her mind filled with questions about why her birth-parents gave her up. She confides in her grandfather, who explains to her that she was adopted from a refugee camp. One fine day, Amudha goes missing, having hopped on a bus to Rameswaram. When Thiruchelvan and Indra find her, realizing how important it is for her questions to be answered, they agree to take her to war-torn northern Sri Lanka to locate her birth-mother. A lesser director would have perhaps resorted to keeping identities of characters a mystery, trying to surprise audiences by connecting dots at key points to keep audiences interested. Ratnam instead lays all the cards out face-up from the beginning. He opens his film with Dhileepan and Shyama’s marriage (J.D. Chakravarthy and Nandita Das in delightful cameos). The Sri Lankan army encroaches into their territory soon after as Dhileepan leaves to fight for his people while a pregnant Shyama is forced to escape to India on a raft. On the journey, she hears from the boatman that Dhileepan has been injured in an explosion. Shyama arrives in India, gives birth and Ratnam cuts directly to nine years later to Amudha introducing us to the people around her and drawing us into her world. From here on, KANNATHIL MUTHAMITTAL unravels through her eyes. The beauty of this film lies less in the plot points and more in the way Ratnam writes and shoots each scene. To begin with, his casting is detailed and absolutely flawless even in the smallest of roles. Be it Nandita Das and Pasupathy as siblings or Prakash Raj as the Sinhalese friend who helps Thiruchelvan’s family look for Shyama, each look their part to perfection. Even gutsier is Ratnam’s audacity to cast two significant stars of the time, R. Madhavan and Simran and relegate them to supporting roles, allowing P.S. Keerthana to take the lead as Amudha. Madhavan as the obnoxious writer is a scene-stealer while Simran as a mother of three made the best of what was her career-best role. And trust Mani Ratnam to extract ridiculously real performances from children. P.S. Keerthana’s performance exemplifies the kind of maturity and multi-faceted emotions seasoned actors are associated with. If for nothing else at all, filmmakers who are fortunate enough for an audience with Mani sir should pick his brain about how to communicate with child actors. The scene below where Thiruchelvan reveals the truth to Amudha about her adoption exemplifies not just Ratnam’s mastery of directing performance, but the genius with which he can shoot and construct such a simple piece of plot in such an interesting manner. With the bulk of the film banking on an emotional connect with Amudha, Ratnam almost stops his film at points of her emotional turmoil and accentuates, explores and expresses those emotions deeper using music. For example, after Thiruchelvan’s talk with Amudha at the beach, she sits with her mother on the swing being fed her dinner, confused and scared of how her brothers might react if they find out that she was adopted. She incessantly and insecurely asks question upon question, an entire gamut of thoughts running through her mind as her mother struggles to comfort her. It’s almost as if at this point, Ratnam decides that a conversation simply will not do. The scene seamlessly leads into the haunting “Oru Deivam Thantha Poove” song where Vairamuthu’s lyrics and Rahman’s music capture what the mother wants to say, while Ratnam and cinematographer Ravi K. Chandran use the visuals to explore Amudha’s emotions. The song opens on the beach with Amudha standing atop an uprooted tree, a metaphor for how she feels, unaware, confused about her own roots and beginnings. In the subsequent stanza, Ratnam has her run up and down inside an abandoned boat as Chandran follows her movements with his camera. The same song is repeated later in the film, picturized with father and daughter this time, as a search for peace and meaning after Amudha witnesses a suicide bombing in Sri Lanka. No multi-million rupee sets, no European locations, just some magic-hour sunlight and simplicity creating meaning and images that refuse to leave your mind. KANNATHIL MUTHAMITTAL was Mani Ratnam’s first collaboration with cinematographer Ravi K. Chandran who contributed a unique style to the director’s visual language. Ratnam’s previous collaborations with P.C. Sriram, Rajeev Menon and Santosh Sivan exemplified a more classical visual sensibility. While Sivan played with light and composition, Chandran played with movement. In much of the film, the camera is almost always moving, almost as if to emulate the protagonist’s energy. The film marked Ratnam’s transition to a post-modern visual language. This film stood strong because that transition still remained anchored and grounded in the director’s penchant for character depth and emotion. In his subsequent films however, that post-modern visual language gained prominence while characters became flatter and drama watered down. Watered-down, the drama of KANNATHIL MUTHAMITTAL is certainly not, for Mani sir milks each and every scene dry to its last remaining drop of melodramatic value. Amudha, like any other child, never quite has much clarity of thought, and Ratnam uses this quality throughout to extract and play on conflict, internal and external alike. One moment she resents her mother, the other she fears hurting her. One moment she appears understanding and appreciative, while at others she can be downright rude and cranky. Indra isn’t the unrealistically strong mother either. She has her moments of weakness, her own insecurities. In the midst of it all stands Thiruchelvan, willing to put his life aside for his daughter, to help her find peace, no matter what the circumstances. But it’s not all just family drama Ratnam serves up. In fact, the director can barely resist his penchant for romance and subtle humour as he cuts to a poignant flashback where Thiruchelvan explains to Amudha how she adopted him and Indra as opposed to it being the other way round. The romance begins with Indra reading a heart-wrenching story Thiruchelvan writes about Sri Lankan refugees and a lone child born to a woman who decides to go back to her homeland. The scenes of Thiruchelvan proposing to Indra so he can adopt Amudha, the subsequent scenes breaking the news to his elder sister and Indra’s father are laced with subtle, real humour, poignancy and the signature Mani Ratnam class. Romance is not all that Ratnam shows off, for with his new-found cinematographer and editor, the shutter speed on the camera is cranked, bombs explode and limbs fly in a spectacular battle scene between the Sri Lankan army and Tamil fighters. “Ridley Scott ain’t got nothin on me!” screams Ratnam as in the midst of all this razzle-dazzle, he still ensures he maintains Amudha’s point of view. With ALAIPAYUTHEY, Ratnam had changed editors from the very talented, classical and seamless Suresh Urs to the more edgy Sreekar Prasad. Though also contributing significantly to Ratnam’s transition into a post-modern cinematic language, Prasad ensured that the basics of emotional juxtaposition were always in place. In KANNATHIL MUTHAMITTAL, he exhibits a tremendous sense of pacing and rhythm, while not missing opportunities to have a little fun cutting songs and action scenes. The ramp effect is perhaps one of the most annoying additions to post-modern film editing, yet Prasad uses it tastefully in songs like “Sundari”. KANNATHIL MUTHAMITTAL won a National Award for Best Film Editing, in addition to awards for Best Tamil Film, Audiography, Child Artiste, Lyrics and of course Best Music for the Mozart of Madras. One of A.R. Rahman’s most underrated soundtracks, KANNATHIL MUTHAMITTAL is also one of his most soulful. Be it the hypnotic “Vellai Pookal” that Ratnam uses to open the film with, or the Sri Lankan styled “Signore”, Rahman attempts several innovations that sadly went unnoticed and unacknowledged by the public at large. His background score was impactful, though some argue that it was perhaps a tad over the top, almost too Hans Zimmerish in many a scene. While Mani Ratnam certainly strikes a chord with character and drama, KANNATHIL MUTHAMITTAL has been called for its overt Pro-Tamil stance, and even for its simplistic portrayal of the Sri Lankan Civil War. These criticisms are perhaps out of place for if anything, the stance Ratnam takes in this film is purely humanitarian. Yet he doesn’t shy away from expressing concern. In a seemingly preachy discussion between Harold Vikramasinghe and Thiruchelvan about war, Ratnam includes a line about how Amudha’s generation might perhaps be able to find a solution to end the fighting. This, right after Ratnam follows an irate Amudha into a marsh where she is suddenly surrounded by child soldiers with AK-47s in hand. Mani sir often writes between the lines, and we have learned equally well to read between them. The only problem now is that he has stopped writing in those places while we still continue to search there. Double century and still not out Vijay…. Was anticipating this one from you and Kannathil Muthamittal as a movie and this post too makes for an enlightening read. In the groove of this blogathon, I have revisited all Mani Sir’s film again and re-visiting this one only enhanced my love for it. Though Keerthana and Madhavan were definite scene stealers but i was bowled over by Simran’s character and the way she depicted it. Her insecurities with Amudha is one of the highlights of the film which is shown in very small details like after the blasts when Prakash Raj hands over Amudha by doing a check up with the doctor and she latches on Madhavan though Simran had also widened her hands or for the matter when Simran has a conversation with her little boy over phone after landing in Sri Lanka and another when he says to Madhavan that we have left two kids back home for one of our kid are beautiful moments. Thanks Ajay for your kind words. Yes I did upload the scenes on my own because a discussion about a film is far more effective if we can rekindle our memory by watching what we’re talking about. goosbumps! that was what i wa lef twith throughout watching this film in a theatre. I was not conversant in Tamil back then and had opted to watch the telugu version, it was an empty theatre, simran and madhavan in a non glamorous role perhaps didnt didnt excite telugu film goers much, and i was sceptical! yet what i wintessed was pure cinematic excellence. The story of lankan civil war has been told in other films , but never with such sensitivity and innocence. The master stroke of an idea of having the story told through the point of view of a child made a powerful and emotional appeal for peace and sanity- something that the bigoted and prejudiced adult mind cant fathom easily. The scene where amudha witnesses a suicide bombing is my personal favorite, the entire film kind of culminates into this one scene, where childhood is juxtaposed with childishness of the adults in thinking thsat war is a solution to anything. I have seen Santosh Sivan’s TERRORIST which never overtly took any political stance on the Sri Lanka issue. It was purely an internal, human drama. Then I have seen the terribly made IN THE NAME OF BUDDHA. What other films referencing the Sri Lankan civil war would you recommend? Totally agreeing with you. KM was the last film from Mani Sir. And it was perfect in every sense, probably his best. Thanks. I’m not sure how anyone can watch a Mani Ratnam film in bits. Do watch it. Fantastic post! Your posts have taken this blogathon to an altogether different level. Love the way you include the video clips in your post. Please keep coming up with the little technical stuff. It is enriching. Thanks Rasik. If we’re trying to take a closer look at a film, it’s important to watch the scenes we’re talking about. We tend to find a lot more after watching it following some thought and discussion. What can I say…. Am I even fit to wirte anything about this post which was equally exhilirating as the movie? Thank you very much for your kind words, lekin yeh thoda zyaada hi ho gaya. Well, Akila has always longed for a daughter(not that she is married :p) and hence this film is special for her. Read this piece written by her, you might understand her feelings for the film and her cravings for a daughter :). Fantastic Post. The way you explain the technical nuances is simply brilliant and makes your post a class apart. I had seen this film a year back and was once again impressed by Mani Sir’s grip over the craft. The best thing about his films is it seems straight out of life. The way he made Keerthana perform only proves that this could only be the work of a master storyteller. Like in Anjali, the simple middle class life is depicted so very beautifully esp. the scenes between Amrutha and her two younger siblings. Madhavan & Simran were really endearing. Simran’s performance especially was a revelation. The war torn Srilanka and the other aspects have been portrayed brilliantly. The scene which you mentioned in which Amudha is surrounded by child soldiers gives goosebumps.Although my memory of the film has become weak since I saw it a year back, your post makes me want to revisit the film. It is true that this was the last time Mani’s brilliance shone minus the technical & visual wizardry.But then as it was rightly mentioned in a review of Raavan, that even on a bad day,Mani Ratnam is leagues ahead of the riff-raff who call themselves as directors. Once again brilliant post, keep ’em coming more often. Thanks Aditya. I too think a lot of ANJALI when I watch this film. It’s almost as if that Mani sir had been revived. It’s just unbelievable how wonderfully well the children in both films performed. What is even more striking is Mani Ratnam’s ability to accurately understand and portray a child’s sensibility. We like to say that children are pure at heart, children never mean harm. But if you remember, in Anjali, when Shruthi, the girl who plays Anjali’s elder sister feels insecure after Anjali is brought home, she confides in her brother that she prayed for Anjali to die. 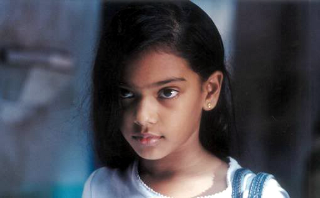 Similarly in Kannathil Muthamittal, Amudha’s insecurities tend to make her jealous, confused, rude, cranky and so on. Another director who is excellent in drawing great performances from children is the Malayalam filmmaker Murali Nair. Watch his film UNNI and you’ll see what I mean. Fantastic write-up,I don’t have much to say on the movie as your post seems to cover everything anyone has to say about it.I accidenly chanced up on “Kannathil Muthamittal” and it was a special experience.I loved how Mani Ratnam chose to keep it simplistic and straight forward.My favorite scene is Maddy disclosing the truth and was awestruck by the way he chose to shoot the scene.and performances of children was very iranian like.Really like it when film makers portray children as they are.Haven’t seen Mani sir’s earlier films other than Nayagan,so really don’t understand the accusation of this being sappy,slow and overtly melodramatic,if anything it had natural flow as compared to Ratnam’s painfully detailed,but plain and boring Guru.And as for the music “Vellai pookal” is one of ARR’s best. The power of a good write up on a movie lies in compelling the readers to watch it; and this post more than does that. And with the last lines … “The only problem now is that he has stopped writing in those places while we still continue to search there.” you have summed up what all Mani Sir fans feel at the moment but could not find the right words for. Great review, wonderful analysis. I am glad that I chanced upon your blog. While each scene seems etched in your mind, my personal favorite in the last 10 minutes – the interactions between Keethana, Nandita and Simran. Was a bit surprised that it did not feature in your “to watch” scene. And I am sure that you have a reason. Can you share it as well? Written a long before and only came to read now. In 2015 after the latest release of Mani Ratnam Sir, Oh Kadhal Kanmani; first of all sorry for being so late tot reach such a fantastic review about my most favorite tamil movie. Never saw such an amazing description about this movie. As I was too low in Tamil at the time the movie released; its my mom who helped me to get the word by word meanings of the dialogues. From that very first ‘Vellai Pookkal’ to the end I have some special feelings in my veins and nerves whenever I watch this movie. And to the one who wrote this, KUDOS! This is an awesome piece of writing which makes everyone watch the movie. This shows up how much you love Mani sir and Rahman sir. Keep on writing. And many many thanks for this awesome post. I can see how deeply you are in to this movie. Stay blessed.